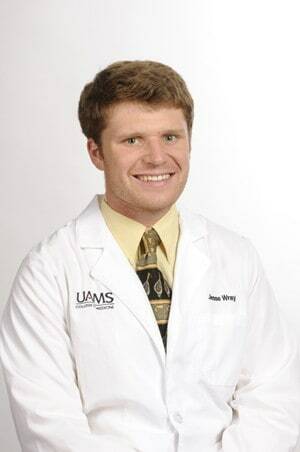 Sept. 23, 2014 | LITTLE ROCK — Jesse Wray, a first-year medical student from Crawfordsville, has been awarded the Ralph B. Hamilton, M.D., Endowed Scholarship at the University of Arkansas for Medical Sciences (UAMS) College of Medicine. Wray received his undergraduate degree in biology at the University of Arkansas in Fayetteville in May. While there, he was active in the Alpha Epsilon Delta premedical honors society, the Order of Omega Greek leadership honors society and Lambda Chi Alpha fraternity, for which he served terms as secretary, recruitment chairman and president. He was recognized as the outstanding fraternity chapter president at the university in the spring of 2013. Wray participated in undergraduate research in the field of astrobiology. Wray’s volunteer activities during college included work with Big Brothers Big Sisters of Northwest Arkansas and the Volunteer Action Center Literacy Program. The Ralph Hamilton, M.D., Scholarship Fund was founded in Crittenden County almost 25 years ago to help local students in their quest to become doctors. UAMS began administering the scholarship this year. “The board is pleased that UAMS is able to continue this fine scholarship that honors a truly great man,” said Steve Schoettle, M.D., a 1981 UAMS graduate and president of the local board that formerly administered the scholarship. Hamilton was a family physician and the first chief of staff at Crittenden Memorial Hospital in West Memphis, Ark. He graduated from UAMS in 1934 and, following a medical internship in New Jersey, established his practice in West Memphis in 1936. Hamilton was widely known for his compassion and dedication to his patients and community during his 57 years in practice. He died in 1991.